Filetmignon Steak From Japan - Grade A 5 - One 12 oz. Steak. 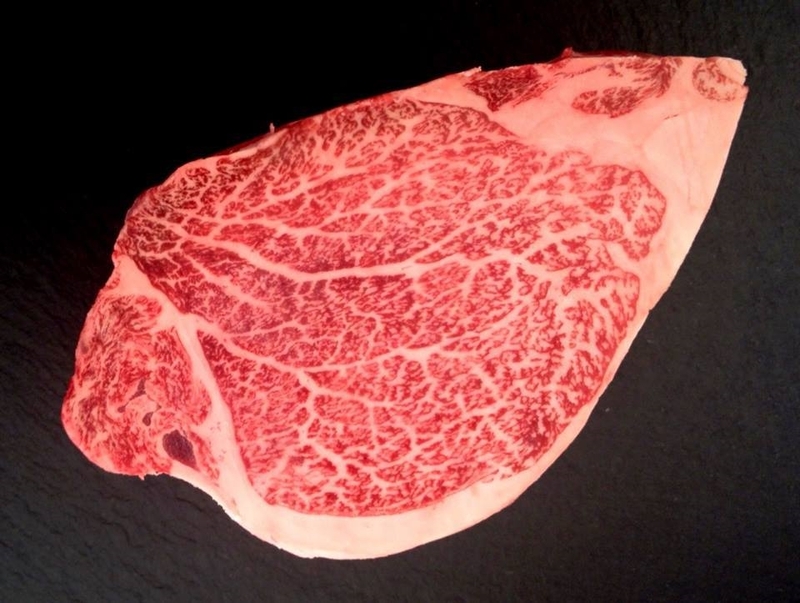 Our Japanese Wagyu Beef is legally imported from Japan and inspected by USDA on arrival. Our Filetmignon Steaks are cut from Japanese Tenderloin at local USDA inspected facility in Los Angeles, CA. All our steaks are individually stamped as required by USDA guidelines. Our Japanese Filetmignon Steaks are juiciest and tender of all the steaks. This marvelously rich, yet mellow boneless cut comes from the heart of the short loin where the most abundant marbling, tender texture and succulent taste is found. This steakhouse classic goes by several different names such as "Tenderloin steaks" as well as "Chateaubriand". Bottom line: This is a boneless steak cut from the top loin, the most tender. Filetmignon is a steak cut of beef taken from the smaller end of the tenderloin, or psoas major of the beef carcass, usually a steer or heifer. In French, this cut can also be called filet de bœuf, which translates in English to beef fillet. The tenderloin runs along both sides of the spine, and is usually harvested as two long snake-shaped cuts of beef. The tenderloin is sometimes sold whole. When sliced along the short dimension, creating roughly round cuts, and tube cuts, the cuts (fillets) from the small forward end are filetmignon. Those from the center are tournedos; however, some butchers in the United States label all types of tenderloin steaks "filetmignon." The tenderloin is the most tender cut of beef and is also arguably the most desirable and therefore the most expensive. The average steer or heifer provides no more than 500 grams of filetmignon. Because the muscle is not weight-bearing, it contains less connective tissue, which makes it tender. However, it is generally not as flavorful as some other cuts of beef (example, primal rib cuts), and is often wrapped in bacon to enhance flavor, and/or is served with a sauce. Filetmignon may be cut into 1- to 2-inch-thick portions, then grilled and served as-is. High heat is the usual method for cooking the filetmignon, either grilling, pan frying, broiling, or roasting. Traditionally in European and American restaurants, fillets are most often served in a cognac cream sauce, au poivre with peppercorns, or in a red wine reduction. Bacon is often used in cooking filetmignon because of the low levels of fat found in the cut, as fillets have low levels of marbling, or intramuscular fat. Bacon is wrapped around the fillet and pinned closed with a wooden toothpick. This adds flavor and keeps the fillet from drying out during the cooking process. Traditional cooking calls for the filetmignon to be seared on each side using intense heat for a short time and then transferred to a lower heat to cook the meat all the way through. Filetmignon is often served rarer than other meats. Those preferring a more well-done steak can request a "butterflied" filet, meaning that the meat is cut down the middle and opened up to expose more of it to heat during the cooking process.